- „So, how do you find the children?” I admit that the local government officer’s question made me smile. But hey, how should the highest person in power in Roshkani know that finding kids is no trouble at all. They are everywhere. And they are always first to be there when anything is going on in the village or in town. It’s such a shame that they don’t always end up in the right place or with good and loving people beside them. This time, they were going to hear the Good News of God’s Kingdom. And, who knows, maybe they would even meet with the King Himself? As soon as we arrived in the village, 5km from Straszeni, and stood in the place assigned to us, under a big tree, a little boy came up to us. When he heard what we were planning to do he ran off and shouted it out to others. 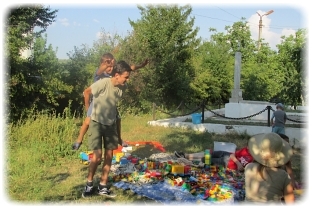 Several of us also went into the village to invite the children and adults to our meetings. After an hour, quite a large group had gathered around. 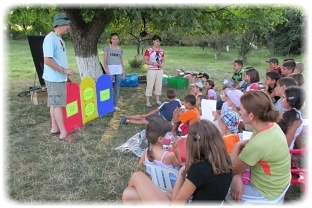 By the end of our 5 days of evangelism, over 50 children had heard about salvation through Jesus Christ. Parents and teenagers came too. What we were talking about was new for all who were there. Of course, many of them keep religious traditions and take part in the life of the Orthodox Church. Sadly, biblical truth is mixed with man’s lies, the Holy Scriptures are unknown, the Gospel is hidden, God’s ways are distorted. For this reason, our presentation and explanation of the Good News was very simple. The whole of our teaching was based on our Lord’s words concerning two roads (Matthew 7:13-14). Using the colours of the Book Without Words, stories from the kids lives, Bible verses as well as competitions, mimes and songs, we spoke of words that bring life. The importance and urgency of these words were brought home to us by a sad event which took place late one evening. One of the boys who had been attending our meetings, 14 year old Victor, had a motorcycle accident. He was taken to hospital unconscious and in a critical condition. Even when we are talking to children we must realize that we are in a spiritual battle for each of their souls. While we are playing with them, laughing together, we must not for a moment forget about the work we have undertaken; nor can we lose purpose but we must remember that spiritual things are worked out in the spiritual realm. During the whole of our trip we experienced God’s protection. Most of all we needed to have no concerns as far as the village was concerned. 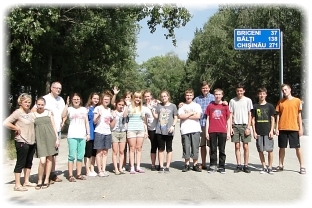 We were welcomed in a very friendly way by the villagers who helped us with different things throughout our stay. The Community centre was opened for us to leave our materials in, so that we didn’t have to bring them with us each time. One of the girls’ fathers gave the kids and us watermelons. 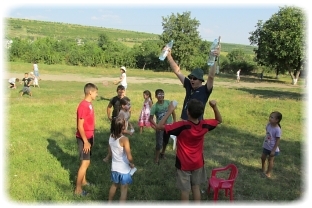 Also, thanks to his kindness we had free access to water which we needed for games with the children. 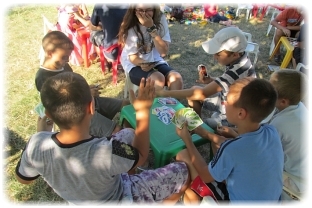 When we talked with the parents they thanked us for organizing activities for their kids and asked us to come back again. A huge blessing was the tree! 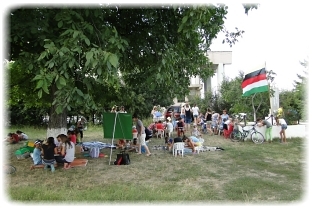 The children and the team were able to withstand temperatures of over 30 degrees Celsius in the shade of the tree. And, in the evenings we returned tired out to our Mission House ‘Metanoia’ in Straszeni, and we thanked God for the comfort awaiting us! This was a really blessed trip although not without problems. Even before we set off for Moldova, two of the three cars we were taking needed repairs. One of them needed work done on it the morning we were leaving and we prayed that the mechanics would get it done on time. The biggest difficulties came on our way back to Poland. They really started in Moldova. The battery in the mini bus went flat. To get to Lwow, we had to use two of the car batteries alternatively in the mini bus. Then, in the other car we started to hear strange noises. In the Ukraine, in Ternopilu, we had a small crash, then we got lost at the crossroads, and then just before the Polish border, in Rawie Ruskiej, a car came driving straight towards us and it is only thanks to a miracle that we didn’t collide. When I think about our return journey, the following verse comes to mind, Psalm 34:19 “A righteous man may have many troubles but the Lord delivers him from them all.” It is true that the Lord saved us from all troubles and even those we didn’t even know about! Happy, healthy and all together we returned to our homes in five different Polish towns (Gdynia, Kole, Kalisz, Tczew, Warsaw). Thank you all for your prayers! All that I wrote above shows how important your prayers are. That’s the most important thing, and everything else is just a proverbial dot on the ‘i’ – if I can express it like that. Thank you to everyone who has supported us in any way, financially, materially, encouraging emails or phone calls! I am certain that we were all there together in Roszkani! 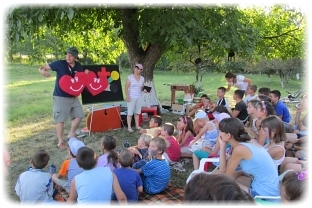 We continue to pray for this village and its inhabitants; for Moldova and the work we are involved in there. May God’s Spirit guide us, in all our crying out and in all our decisions, according to His will.